I have been growing Amaranth for about 8 years now. I prefer Amaranthus caudatus the Love Lies Bleeding variety for it's long ropes of flowers and seeds. I first starting growing it as a feed source for the chickens, but I found it so beautiful and easy to grow that I have continued to grow it every year. It makes a striking centerpiece for my garden! The love lies bleeding variety of Amaranth is an annual that grows 3' - 4' in height. It is possible to grow as tall as 8', but I've personally never seen that. It's characterized by the long ropes of blood red flowers and red tinged stems with green leaves. It grows easily from seed and prefers full sun. Both the leaves and seeds of the Amaranth plant are edible. I kind of hesitate to admit this but...I have never eaten the seeds or the leaves of the amaranth plants that I've grown. Crazy, I know since I am one of those 'eat the weeds' people. Somehow this plant got pigeonholed in my garden as a animal feed plant and an ornamental. I promise I'll try it this year! Till then though...this is how I grow amaranth. I pretty much do nothing and it pops up everywhere! Not kidding. Each plant produces thousands of seeds. 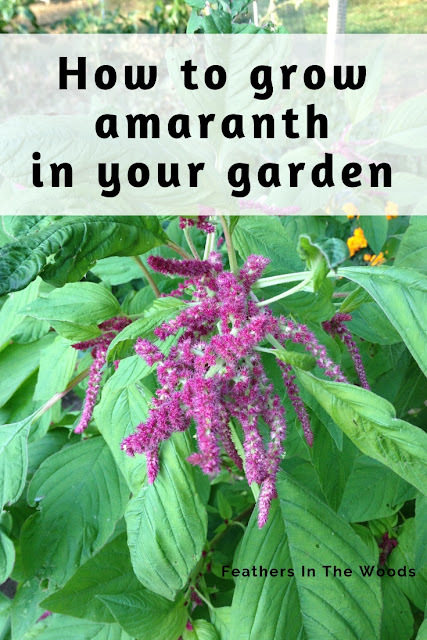 You will not manage to harvest them all so the number one piece of information I can give you about growing amaranth is: watch where you put it! When you're first planting amaranth though, I found it easiest to direct seed it as soon as the soil temperatures warmed up. If you prefer to start your seeds indoors, sow seeds 6-8 weeks before your anticipated last frost date. If you want to pre-germinate your seeds be prepared to act fast. Amaranth can sprout in as little as 24 hours! Till your garden bed well and add compost before planting. Plant seeds 1/4 to 1/2 inch deep 12" - 18" apart. Plants can grow up to 3' across so make sure they have space to grow! Keep soil damp and seedlings will emerge in 10 - 14 days. 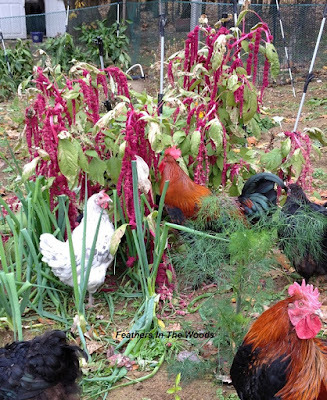 Amaranth grows best in a rich soil with a lot of compost, but it can do ok in poor soil also. The richer the soil, the taller your plants will grow. Mulch after seedlings appear. Amaranth does not require a lot of water if it's well mulched. It may require staked though. I know a lot of people say that amaranth does not need staked, but this variety will lean over till it's touching the ground if you don't stake it up. Must be those long heavy seed heads! It takes about 3 months for the flowers to emerge. The seed heads (also called tassels, ropes or tails) can grow up to 2 feet long! They are covered with tiny crimson colored flowers. They are often cut and used in flower arrangements since they can hold their color and stay beautiful for weeks. If you find the plants are too close together then thin them out. The leaves of the smaller plants are still tender enough to eat as salad greens. The leaves of the older plants will need sauteed like spinach. By the end of summer your plants should be super tall with long flowing ropes of flowers filled with seeds. The seeds are not all ready at the same time so harvesting them can be a little tricky. To harvest the seeds I like to get a paper grocery bag and hold it under the seed heads. Lift it up so they're just inside the bag and shake the seed heads into the bag. The seeds that are ready will fall off and the rest can be left on the plant to finish maturing. I do this about once a week until the first frost. If you'd rather harvest all the seeds at once then wait until after the first frost. Either way, after the first frost cut the seed heads off the amaranth plant and allow them to dry on a tarp, sheet or a very fine drying screen. You'll need to thresh and winnow the seed heads to get the grain to a useable state. Unless you're using it for chicken feed like I did...then threshing alone will be fine. Thresh: To separate seed from a harvested plant mechanically. Winnow: To remove the chaff from grain by blowing a current of air through it. Here's an excellent article on different options for small to medium harvests: How to thresh and winnow on a small scale. Growing love lies bleeding amaranth is easy and each plant produces a lot of seed that can be used as a grain, ground into flour or used for animal feed. Each plant can produce a pound of seed or more! I've had a lot of success with this variety so this year i al going to add golden giant amaranth to my garden. Wish me luck! If you're looking to add love lies bleeding amaranth to your garden this year, I bought this one from bakers creek. Related reading: Want more information on organic gardening? Check out this collection of articles on gardening. Need help tracking your garden progress this year? Check out my friend Julia's Vegetable Garden Planner. It's a downloadable planner that you can print out and track your entire garden season, the good and the bad...and it's half off right now!